ATLANTA, Ga. – Tea Party Patriots Citizens Fund (TPPCF) Chairman Jenny Beth Martin today released the following statement, announcing that the Super PAC associated with the nation’s largest Tea Party group has endorsed Chip Roy for the GOP nomination for Congress in Texas’s 21st congressional district. 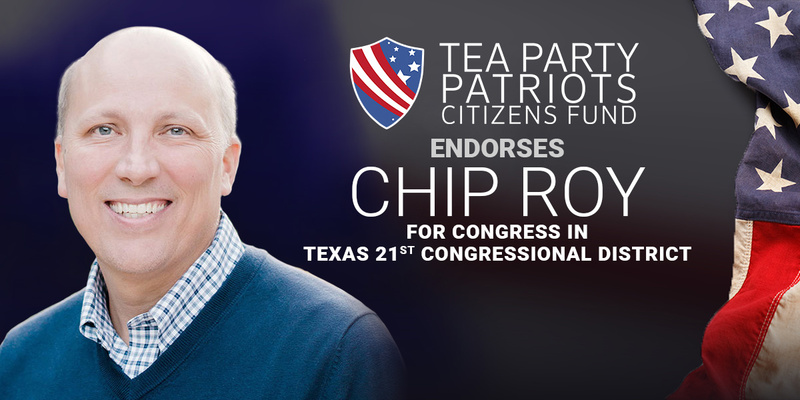 “Chip Roy has the experience, the values, and the character to be an outstanding Member of Congress. “On the issues, Chip is a solid Constitutional conservative – he opposes illegal immigration and wants to secure the border; wants to repeal ObamaCare AND Congress’s illegal special exemption from ObamaCare; opposes Common Core; supports fundamental tax reform to make the IRS Code fairer, flatter, and simpler, and to create the economic growth that will lead to good and better-paying jobs; and will work to reduce federal spending. “That’s what one would expect from a conservative candidate for Congress. But there are two unique qualities about Chip that commend him to the attention not just of Texas conservatives, but conservatives across the country, and make his race an opportunity not to be missed. “First, in his last job, leading the Tenth Amendment Center at the Texas Public Policy Foundation, Chip warned of the concentration of power in Washington, DC, and promoted the return of power to the state and local governments. “Second, Chip served as Sen. Ted Cruz’s first chief of staff. While Sen. Cruz stood up for conservative values, even to the point of engaging in fights against his own party’s leadership, Chip was standing right behind Sen. Cruz, making sure Sen. Cruz had what he need to carry on that fight. Chip’s well-earned battle scars have prepared him for what awaits him in Washington as a Member of Congress.